152 local residents attended this meeting; as did the head of the Suksun District, Alexander Osokin; the deputy head in questions regarding health and education, Olga Kruglov; and six members of the local administration. Representatives of the authorities introduced the plans of re-organizing the school. The planned complex will only include a kindergarten and an elementary school. Previously, authorities had promised residents that the comprehensive school in Vaskino would remain – to carry out a general renovation of the old school building and to connect it to the new building by a warm passage. The decision to turn this school into a primary school was met by rejection and resentment by local citizens. The general meeting of residents recommended considering general order 99 of the Suksun District Office of Education from 3 June 2010 invalid and to stop the reorganization based on article 50, paragraph 17 of the education law of the Russian Federation. It was also decided to petition the Ministry of Education of the Perm Krai to award the school the status of a school with intensified study of the native national language, history and culture. “We, the parents of the villages of Vaskino, Ivankovo and Tebenyaki, declare our opposition to the reorganization of the Vaskino comprehensive school. We, the parents, have not talked about this anywhere up to this time, as we are constantly given promises. But how long can we continue to remain silent and to keep our mouths shut? First we were promised that a new comprehensive school would be built, and then it was decided to build a new primary school and to repair the comprehensive school completely. Now what? We demand that the government fulfills its promise: to keep the comprehensive school in operation until a new one is built. You must understand that if there is no school, our Mari villages will disappear as well. The Maris will not only disappear from the Suksun District, but from the Perm Krai. We will set a condition: If our school is closed, we will not send our children anywhere. They will sit at home and not receive any education”. 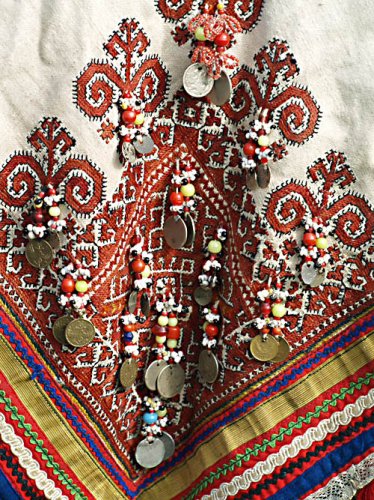 The Maris of the Perm Krai constitute a unique ethnic group – according to the 2002 census, there were 5,395 Sylva Maris, most Maris’ roots in the Suksun Disctrict date back to time immemorial. There are seven Mari villages: Vasinko, Ivankovo, Tebenyaki, Syzganka, Krasnyj Lug, Kamenka and Tukmany. The core of the Mari community lies in the three Villages of Vasinko, Ivanko and Tebenyaki, where Mari has been retained as a language for every-day communication not only by the elderly, but also among children. The other villages are mixed – Maris of the younger generation can hardly speak the language. Children from the three aforementioned villages went to the Vasinko comprehensive school, which the villagers are trying to save. Sylva Maris are not only unique in the diverse specter of peoples home to the Perm Krai, but also in the Mari world. They have preserved many elements of ancient Mari culture, have an own unique national dress, an own dialect, and an own way of thinking. In spite of their low number in the Perm Krai, they still retain their language. This was made possible by the existence of a national school. Maris, speaking their national language in the remote Perm region, should be the pride of the krai and could at this point could be seen as an indicator for how much attention has been given to national languages and cultures in the Perm Krai. However, state officials apparently do not understand this, and in spite of the opinions of residents have decided to close the only Mari school in the Perm Krai. I truly find this a interesting subject. Never looked at this subject in this way. If you are planning to create more articles about this subject, I definitely will be back soon! Yes .Tell us more. These schools need to stay open. We want to learn about these Mari people.